– Washington emphasizes its support for Haiti and the Dominican Republic, with SOUTHCOM sponsoring new programs – but will these initiatives be enough to stem the flow? – Will the UN Mission in Haiti mutate into an effective counter-drug trafficking instrument? The two nations that occupy the island of Hispaniola, the Dominican Republic (DR) and Haiti, have experienced an alarming surge in drug trafficking traversing their borders en route to North American and European markets. The entire Caribbean region has become the latest conduit through which illegal drugs coming from South America (principally Colombia) are trafficked by Colombian and Mexican drug cartels and their local affiliates to their final destinations. These latest developments have prompted numerous crackdowns on drug traffickers operating on Hispaniola by local forces; however, there persists the issue of a lack of funds, personnel, training, and a master strategy, not to mention ongoing corruption in the two countries, which certainly have hobbled efforts at stifling the anti-drug strategy. During last March’s Santo Domingo Summit on Drugs, Security and Cooperation, DR’s president, Leonel Fernández, declared that the U.S. has not done enough to aid Caribbean nations in tackling drug trafficking. Washington has donated limited amounts of economic aid to Haiti, and the U.S. Southern Command (SOUTHCOM) forces have continued its exercises with Caribbean defense forces, donating equipment to help nations like the DR to crack down on drug smugglers. However, such actions appear to not be sufficient to curb an increasing amount of illegal narcotics coming from the region. Recent developments, like declarations, whose purpose is to transform the UN Mission in Haiti (MINUSTAH) into an anti-drug force, may be a signal that the international community is getting serious about the ongoing problems of drug trafficking in Haiti. Nevertheless, it is yet to be seen what powerful entities like the European Union (a growing destination point for South American and Caribbean basin drugs) will do about this critical issue. There is a growing necessity for a decisive inter-continental policy of dealing with drug trafficking, and Hispaniola should certainly be the location where Washington and Brussels should come together to draw up a major strategy to stop Mexican and Colombian drug traffickers from carrying out their dirty businesses unchallenged. The Dominican Republic is a prime transshipment country. For its part, Santo Domingo claims that it is not receiving as much aid from Washington as it requires. For example, President Fernández has accused Washington of reducing its surveillance of the Caribbean by more than 60 percent, with fewer ships and planes dedicated to the pursuit of traffickers. In an effort to expand its vigilance against drug trafficking, Fernández has pledged that his country will buy eight Brazilian “Super Tucano” fighter jets at a total cost of $92 million. In the past year, numerous incidents have demonstrated that the DR is a major venue for the drug trade. As part of a nationwide campaign that ran from August 16 to October 12, 2006, almost 1,500 locations selling illegal drugs were ordered to be shut by the government. The National Drug Control Directorate (DNCD) announced that of these, 296 were in Santo Domingo, 237 in the surrounding Santo Domingo Province, and 222 in Santiago, the country’s second largest city. The police also seized 109 kilograms of cocaine in October 2006 and arrested four suspects in the administrative region around the Dominican capital of Santo Domingo. Those detained by the DNCD included one Chilean and three Dominican nationals. Even Dominican police officers are not immune from involvement in illicit drug use. In August 2006, the country’s national police directorate fired 61 officers for testing positive after a random drug sampling was administered. Dominican government officials said that 16 of the 61 sacked officers had tested positive for cocaine. Due to its location, the Dominican Republic has become a favored route for transporting drug shipments to Europe. In one such scenario, according to Spanish national RNE Radio 1, members of the Civil Guard’s judicial police arrested a woman of Dominican citizenship in La Coruña (northwest Spain). She was suspected of receiving packages sent by air from the Caribbean island to her home in La Coruña. The shipment in question consisted of three bags with 84 shoes, containing over 21.5 kilos of cocaine in their hollowed heels. Haiti is one of the most convenient launching points for cocaine being spirited out of Colombia en route to Florida. As reported by Isabelle Ligner of the Agence France Presse, traffickers are attracted by Haiti’s weak legal system, easily bribed police and 1,500-kilometer (900-mile) coastline that is all but unprotected. Haitian authorities have permitted U.S. Coast Guard patrols into its waters and U.S. planes into its airspace in hot pursuit of suspected felons since 1997, in order to track down smugglers, with mixed results. Ligner notes that Haiti neither processes nor consumes cocaine. However a Haitian government official has been quoted as saying that “growth of drug trafficking in Haiti is one of the main reasons [why] the national police, just a decade old, was so quickly corrupted.” Such declarations, in addition to those made by Haiti’s President Préval, illustrate that while Haiti is not a cocaine producer, it is certainly a transit route for the product, with a local population supplying at least some consumers as well. It is unrealistic to believe with any conviction that the population of a country that is heavily used for drug trafficking does not also generate some drug-consumers as well. There are numerous pieces of evidence that demonstrate the current high volume of drugs going through Haiti. For example, in June 2005, Haiti’s former national police commander, Rudy Therassan (2001-2003), pleaded guilty to offering to protect Colombian cocaine shipments transiting through the country. He was sentenced to almost 15 years in prison. In early May 2007, the police in Port-de-Paix, Department of the Northwest, arrested nine individuals suspected of involvement in illicit drug trafficking. During the bust, police seized more than 200 kilograms of cocaine in three bags. Then, in early June, The Haitian National Police (PNH) and the international police force serving under the flag of the United Nations (UNPOL) seized 420 kilograms of cocaine and arrested 10 individuals, including four Haitian policemen. The drugs, divided into four well-sealed packs and traveling from Cotes-de-Fer (Southeast), were intercepted in the Leogane area (35 kilometers south of Port-au-Prince) during a routine traffic stop on National Road 2, according to the Haitian media. Last April, the Dominican armed forces conducted a five-day military exercise on the border with Haiti. The land, air and naval operations were carried out to prevent the trafficking of drugs, guns and contraband. The operations were followed by exercises designed by SOUTHCOM, which claims that the 400-km-long Dominican-Haitian border is a major staging area for illegal drugs arriving to the U.S. In a report carried by Haitian Radio Galaxie on March 9, PNH Director Mario Andresol hailed the current cooperation between the Haitian and Dominican police. Andresol highlighted the exchange of information between the two nations’ police forces operating on the island in order to thwart the actions of traffickers. The high volume of drug trafficking may inflate the historical tensions between the DR and Haiti. The two Hispaniola neighbors have had numerous low points in their relations, the primary example being the 1937 murder of around 20,000 Haitian refugees and sugar workers, who were living in the DR during the dictatorship of President Rafael Trujillo (1930-1961). Today, around one million Haitians are thought to illegally reside in the Dominican Republic. 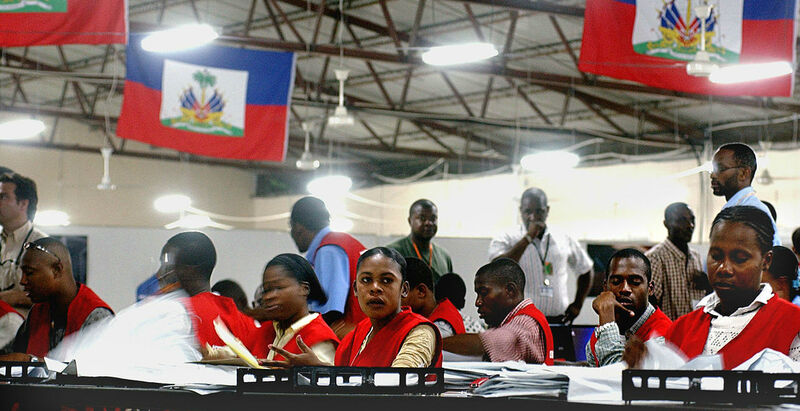 Tensions have risen sharply in the past few months, with Haitians vigorously protesting a variety of racist manifestations by Dominican authorities against Haitian refugees residing in the DR. According to the EFE news wire, a group of 50 Haitians burned Dominican flags after having “wiped their backsides” with them, which caused outrage among Dominicans in the northern province of Valverde. The protestors had to be hastily escorted out of the immediate area by the police after lynching threats were made. Ten Haitians were later arrested on charges of desecrating Dominican national symbols. With weak security services (particularly in Haiti) and tainted judicial systems, in addition to a loosely guarded border, it may be only a matter of time before the governments and the people of each nation replace cooperation with mutual recriminations for propagating the drug trade. On the other hand, President Préval, before attending the March drug summit in the DR, more graphically found that: “no matter where the drugs come from, they go to the United States. So, my problem is the demand in the United States and Europe. The place where drugs are made is not the most important thing. What is important is that, as long as the demand is present, there will be production somewhere. So, fighting drugs in the United States, fighting drugs in Europe [to prevent] demand is the most important thing.” This was somewhat removed from the more muffled statements he made on the subject on other occasions. Declarations made by leaders like Fernández and Préval, who openly claim that they are not receiving enough aid to tackle what is essentially someone else’s problem (since Hispaniola is only a stopover for South American drugs en route to the U.S. and Europe, not their final destination), should be regarded as eye-opening remarks. It appears that drug trafficking in the Caribbean, and especially through Hispaniola, has reached the level where diplomatic statements by government officials are no longer sufficient to obviate an increasingly dramatic situation. To make matters worse, a recent Government Accountability Office study warned that U.S. planes and ships cannot sustain the current level of patrol of the Caribbean for much longer without major overhauls and a replacement of equipment. There are conflicting reports on what percentage of South American narcotics travel through the Caribbean en route to the U.S. According to the United Nations’ 2007 World Drug Report, in recent years, 30-50 percent of the cocaine in the U.S. entered via the Caribbean. However, in 2005 the United States Interagency Assessment of Cocaine Movement had concluded that the proportion had decreased to only around 10 percent. The main smuggling vectors through the Caribbean in 2005 were Haiti and the Dominican Republic (4 percent), Jamaica (2 percent) and Puerto Rico (1 percent). Due to the upsurge in the drug trade from Hispaniola to the U.S., due to an infamously renowned and corrupt legal and police presence in Haiti, Washington essentially has taken on the role of de-facto policeman of Haiti’s waters and airspace to combat the drug cartels. In recent years, the Drug Enforcement Agency (DEA) and the U.S. Coast Guard have played the virtual role of Haiti’s protector, yet President Préval’s declarations suggest that this is not enough. U.S. security agencies have created a network of operational and intelligence groups in order to combat drug trafficking throughout the Caribbean. The pattern for drugs coming from South America through the region is fairly clear by now: speedboats (among other vessels) carry Colombian cocaine to Puerto Rico and Florida by way of islands such as St. Maarten and the U.S. Virgin Islands (eastern Caribbean), as well as and from Hispaniola. The most frequent modus operandi is taking advantage of big ships such as cruise liners which are “fed” illegal drug shipments, often at sea, by speed boats made of materials that are undetectable by radar. The ships are often equipped with cranes, which are used to transfer the drugs while both vessels are in motion. Planes carrying the contraband are becoming more common as well, flying to illegal makeshift landing strips in Haiti to drop off their cargo. The DEA is increasingly resorting to stepped-up joint training operations with the Dominican Republic’s and Haiti’s anti-drug personnel. Recently, American, Dominican and Haitian forces launched “Operation Rum Punch,” to counter the flow of narcotics going through the island. As part of Rum Punch, DEA helicopters flew over the Hispaniolan countryside, searching for drug runners on horseback or motorcycles. In addition, SOUTHCOM sponsors training exercises known as TRADEWINDS, in which security forces from Caribbean nations gather annually to improve their ability to manage a wide range of security concerns and scenarios, including responding to drug trafficking. A spin-off of TRADEWINDS is a program called “Enduring Friendship,” which, according to SOUTHCOM’s website, is a “multi-year U.S. initiative to help partner nations in the Caribbean bolster their capabilities to anticipate and respond to threats and emergencies in their territorial waters.” In addition, the program provides Caribbean nations improved communications systems and high-speed interceptor boats that far outperform anything that the traffickers currently have in their arsenals. The course takes place in Fort Myers, Florida, and has an estimated overall cost of $75 million, most of which comes from the Department of the Defense, with a portion from the State Department. Finally, the 2007 International Narcotics Control Strategy Report, released by the Bureau of International Narcotics and Law Enforcement Affairs, mentions the fact that Washington is contributing three corrections experts to form the nucleus of a sixteen-member UN team that will work on improving the infrastructure and management of Haiti’s prison system. In addition, the U.S. has provided an adviser to help the HNP Director General implement anti-corruption measures. The National Drug Control Strategy’s FY 2008 Budget Summary (published in February 2007) mentions that for 2008, there has been a request by the International Narcotics Control and Law Enforcement (INCLE) of $2 million. This includes a request for additional millions of dollars. According to the report, the INCLE plans to use these funds for: “training and equipping the Haitian Coast Guard for maritime interdiction operations, improving the operational capacity of the Haiti Counter-Narcotics Trafficking Office in cooperation with DEA, and assisting the Haitian government’s Financial Investigative Unit with money laundering investigations.” The request for additional funds will permit the establishment of a Counter-Narcotics Trafficking Office presence outside of Port au Prince – especially in the Northern plateau area where drug-trafficking is endemic. There is no mention of the Dominican Republic in the Strategy’s summary. Nevertheless, in spite of continuous aid and numerous initiatives, flawed law enforcement in combating drug trafficking continues to be a major problem, particularly for Haiti. For example, the 2007 INCSR mentioned how the HNP Director General dismissed 500 officers during 2006 for misconduct. Cases like this are probably the reason why financial aid to Port-au-Prince is quite limited, as Washington policymakers believe that it will just be stolen by some corrupt Haitian official instead of put to good use. Washington seems to be focusing on trying to improve Haitian legal and law enforcement agencies to make them into an effective drug-combating force and then determining if they should provide more aid. Regarding the DR, focus appears to also be in training and providing new equipment. The Rio Group-European Union (EU) meeting took place on April 17, 2007 in Santo Domingo. In attendance were 50 foreign ministers and nearly 2,000 delegates. Key topics included energy, aid for Haiti, the strengthening of multilateral relations, citizens’ security, the environment, fighting poverty and combating drug trafficking. The Dominican Republic is the current holder of the rotating chair of the Rio Group, while Germany holds the EU’s revolving presidency. It remains to be seen what other steps will be taken by the EU to aid the Hispaniola governments to curb the drug trade, such as dispatching financial aid or sending EUROPOL units to the island. Individual governments like the Netherlands have taken significant steps in recent years to control illegal narcotics coming from the Caribbean through its own borders. The aforementioned United Nations Drug Report explains how “cocaine enters the Netherlands from the Caribbean either by sea, typically via Rotterdam, or by air, mainly via Schiphol airport in Amsterdam. However, the importance of Amsterdam has declined drastically in recent years, following the introduction of strict controls (100 percent checks on direct flights from the Netherlands Antilles to Amsterdam) and greater cooperation with the Netherlands Antilles and Suriname. As a consequence, drug couriers choose other Caribbean countries [as launching pads], such as the Dominican Republic, to avoid detection, and are more reluctant to fly directly to Amsterdam.” In addition, the report mentions that in 2005, fully 25 percent of the foreigners arrested in Spain in connection with cocaine trade were of Colombian nationality, with citizens of the Dominican Republic accounting for 6 percent. So far, it appears that there is no overarching and coherent strategy for EU aid towards the Caribbean in controlling the flow of narcotics. Rather, individual governments are taking steps to prevent drugs from entering their borders. Belgian and British vessels crossing the Caribbean, also, on occasion, have cooperated with the U.S. Coast Guard. The issue is that, like the Netherlands, Europe is not so much helping fight drug cartels in Haiti or the DR, but rather is focusing on preventing the drugs from flowing into their countries in the first place by resorting to stricter controls at airports, seaports and land crossings. MINUSTAH As An Anti-Drug weapon? Haiti remains a paradise for drug runners despite the presence of 9,200 UN troops, deployed after president Jean Bertrand Aristide went into an induced exile in 2004 as the country slipped into renewed violence. The new Brazilian Commander for the UN military force in Haiti (MINUSTAH), General Carlos Alberto Dos Santos Cruz, said his troops would confront the drug problem, without clearly acknowledging whether it was a main cause for the violence now engulfing the country. “I cannot say whether drugs are the main problem here, but we are going to face it,” said Gen. Santos Cruz, “We are going to face it under the law and using the means we have.” Since December 2006, MINUSTAH has undertaken a series of military operations aimed at dislodging the country’s gangs from areas which they now control. In February 2007, the UN Security Council extended the mandate of MINUSTAH for an additional eight months. It will now expire on October 15. Turning MINUSTAH into a major counter-drug trafficking force may be only a matter of time. Recently, the UN envoy to Haiti, Edmond Mulet, declared that “there are people involved in corruption, drug trafficking and goods smuggling who are trying to destabilize the government.” In addition, Haiti’s police force repeatedly has often been acknowledged as one of the most corrupt in the entire hemisphere. A February 2006 article in The Toronto Star by the highly regarded Reed Lindsay explains that “Haitian police have failed to stop a wave of violence, just as they have been implicated in numerous high-profile crimes. And in some poor areas, residents are as afraid of the police as they are of criminal gangs.” Such a dramatic scenario means that unless some external unit (i.e. from the U.S., UN or some CARICOM operation) pledges increased aid to the island, drug trafficking will continue indefinitely. Lindsay reports that, according to Haitian police chief Mario Andresol, one in five Haitian police is corrupt, and most of the armed gangs count on at least one local police officer as a member. Corruption and weak legal systems, in addition to hundreds of miles of open borders and coastline, have converted the island of Hispaniola into a drug trafficking paradise. While there is a growing amount of drug-consumption on the island, the Dominican Republic and Haiti are mostly regarded as stopovers for drugs en route to North America and Europe. The occasional drug bust may be good for governmental publicity and self-esteem, as well as for promoting good ties with Washington, but most likely these “feel good” operations just get at just the tip of the drug iceberg.